The battle between the Gargoyle and Phoenix clans has come to a head with countless immortals slaughtered. The clans’ numbers are dwindling, their leaders have been forced into hiding, and only a lucky few survive, scattered to the winds. Among these is the loyal Gargoyle Mentalist, Lilith. After lying low for a season, she and the other survivors have gathered, searching for their comrades and their adversaries. If Lilith can find her allies, she and the Gargoyle clan can destroy the Phoenix once and for all. Today, we're pleased to extend an invitation for you to witness a taste of the betrayals and intrigues in a playthrough of Blood Bound! You can pre-order Blood Bound at your local retailer or online through our website today. 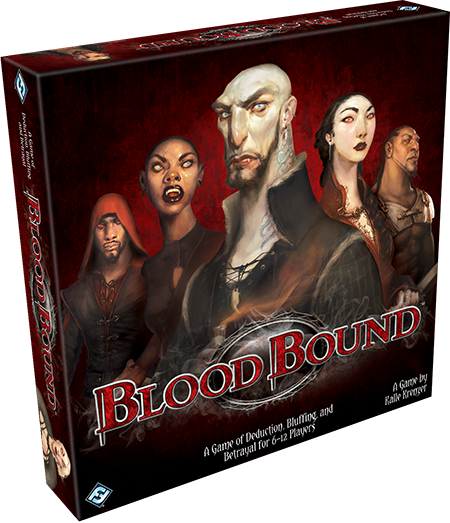 Blood Bound is a social game of lies and deduction that tasks six to twelve players with identifying the leader of the rival clan while protecting their own leader. The players are evenly divided into the two clans, Phoenix and Gargoyle. If there is an odd number of players, the Secret Order will send in an Inquisitor to maintain balance, which you can read about in our last preview, here. In this particular meeting six vampires have gathered, three Gargoyle and three Phoenix, and none of the faces look familiar. Who is an ally, and who is an enemy? 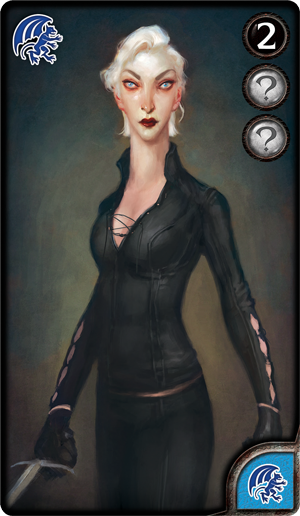 Lilith is loyal to the Gargoyle clan and is therefore seeking to capture the Phoenix Elder. If, however, the Elder has already been killed in the war, the new Phoenix leader will be the member with the lowest number on their card. The same rules apply to Lilith’s own clan. Even though her own rank as the Mentalist is five, if all of the other Gargoyle members have a higher number on their card, she could be the clan leader and not even know it. Before the game of cloak and dagger begins in earnest, Lilith and every other survivor reveals a clue about their clan affiliation to the vampire on their left. In most cases, this clue accurately reflects a vampire's clan—but that's not always the case. Still, there will be at least one other person at the table who can suspect if Lilith lies about her clan, saying she belongs to the Phoenix when she is in fact a Gargoyle. Subsequently, that vampire’s choice to expose the truth or keep Lilith’s secret may help her decide whether the person beside her can be trusted. Likewise, Lilith herself has a suspicion the allegiance of the vampire to her right. In this case, the vampire seems to also be a Gargoyle, meaning that she may have found an ally before the intrigue even begins—a powerful starting position, provided it's true. Once the game begins, the gathered survivors can discuss their identities, but they are under no obligation to be honest. The only way to know for sure is to use more intense forms of interrogation. In Blood Bound, players attack each other with a lone dagger, forcing them to reveal information about themselves until one vampire receives four wounds and becomes captured. As the game progresses, the dagger is passed to each player in turn. In this gathering, Lilith is the first active player and she is faced with an important decision. She may either pass the dagger to another player—perhaps garnering their favor—or she may strike at someone and force them to reveal a fact about themselves: taking a token that shows either their clan affiliation or their rank. If she chooses the latter option, she must be wary. 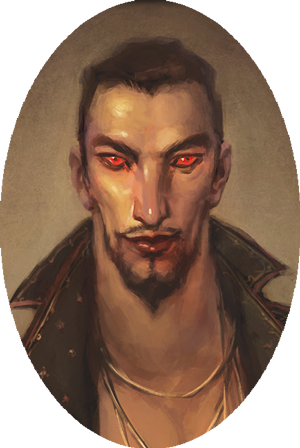 If a vampire chooses to reveal their rank, they may use the special ability that accompanies it. 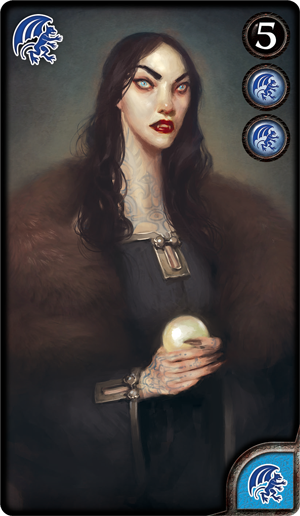 While some abilities can help uncover vital information, such as the Harlequin, who can look at two other players’ cards, other abilities can have more dire consequences. For example, if Lilith wounds a Berserker, they could immediately counterattack and wound her in return. Across the group, a vampire with glowing eyes and a shining amulet flashes Lilith a smirk that she does not quite trust. Despite the risk, she decides to attack him. But before she can land a blow, the vampire to the left of her target decides to intervene. This means that the intervening vampire suffers the wound on the other’s behalf. Lilith does not learn anything about her original target, but the intervening vampire reveals that they are a member of the Phoenix clan. From this, Lilith can deduce that the vampire she had planned to attack is likely a member of the Phoenix clan as well. Why else would a Phoenix clan vampire intervene? With this information at her disposal, Lilith decides to lie, apologizing profusely and saying that she is also a member of the Phoenix clan who would never knowingly harm an ally. The vampire to Lilith’s left, the one who knows that she is actually part of the Gargoyle clan, remains silent. From this, Lilith believes that she has found her last ally, but she has also just made herself a target for the remaining Gargoyle clan vampire on her right. The dagger is now in the possession of the intervening Phoenix clan member. Unfortunately, they did not believe Lilith’s lie and choose to attack her with the blade. She cannot reveal her own clan association without confirming their suspicions and exposing her ally to her left. Therefore, she decides to reveal her rank token. Now, everyone at the table knows that she is a Mentalist, but she can use her ability to inflict a wound on a vampire of her choice and force them to reveal their rank as well. Lilith targets the vampire on her right. By attacking someone she knows is a Gargoyle, she can garner favor with the Phoenix clan. Besides, her single wound will not truly harm the vampire. Her strike finds an Assassin who immediately turns and strikes two wounds against the vampire with the glowing eyes who had been Lilith’s first intended target. Of course the other Phoenix had protected him—he is now revealed to be the clan’s Elder! The wounds inflicted by the Assassin are not considered an attack, meaning that the target does not have to reveal any clues to their identity, but Lilith knows the truth. After a few more turns and attacks, Lilith manages to survive long enough to capture the vampire with glowing eyes and ensure the victory of her clan. She slowly turns to the vampire on her left, the one who had known her loyalty to the Gargoyle clan since the beginning and kept her secret. This vampire had truly been the Phoenix Elder all along, and Lilith has captured the wrong Phoenix. Now, weakened and exposed, the Gargoyle clan is doomed. Will you be able to find your allies and identify your foes, or will a rash decision lead you to ruin? Gather your clan and learn the true price of loyalty! Pre-order Blood Bound (HB11) at your local retailer today or on the Fantasy Flight Games website here!